Does this third update bring back the charm? When Apple released Final Cut Pro X back in June, it caused a furore. This wasn't the Final Cut Pro that people had grown to love, that had revolutionised the video editing industry and that had taken both the independents and the major studios by storm. This was something else, and given how many features had vanished, many thought it certainly didn't deserve its 'pro' monicker. But Apple is keen to show its customers that just because some features were dropped from the current version, doesn't mean that they'll never make a comeback. So it got busy and released two fairly substantial updates last year. Now comes the third one, which is the biggest since the program's launch. 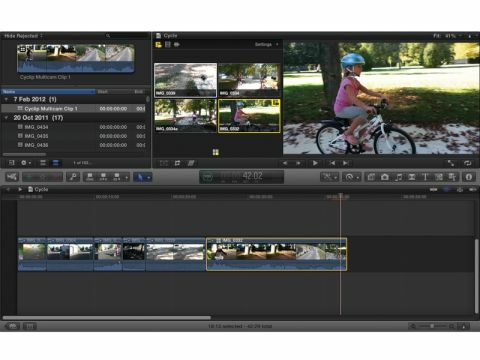 Apple's engineers have tried to meet professional editors' most pressing needs, which include support for multi-camera editing, improved chroma keying, the ability to connect to broadcast monitors, and better import and export options, among others. So how does it all look now? Multicam is easy to use and incredibly powerful. Just like in FCP7, it can handle up to 64 different angles, but unlike its predecessor, you can work with clips of multiple formats and frame rates without having to render or convert them - they all play at the same time in the Angle Viewer. The chroma keying tools that came with version 10.0.0 were already better than version 7's, but the added refinements are incredibly impressive. To test it out, we loaded up one of our first attempts at a green screen, where everything that could have gone wrong, had. The improved Chroma Key filter did remarkably well. It wasn't perfect – we would have been amazed if it was, considering the material it had to work with, but compared with what you could achieve with FCP7's built-in filters, it was impressive. Compatibility with broadcast monitors is absolutely crucial and is achieved via third-party cards as well as Thunderbolt-enabled devices. The process is labelled a Beta, so check with the manufacturers to make sure their solution is compatible - you'll also need to be running Lion. The beauty of this update is that it covers many parts of the editing process. For instance, you can once more work with multi-layered Photoshop files and manipulate each layer individually. Keyframe behaviour has reverted back to the way it used to work: in the previous version, if you set a keyframe then altered that parameter elsewhere along the clip, another keyframe would be instantly created for you. For some reason, that immense timesaver had disappeared in FCPX but it's now reinstated. But perhaps most important of all is the program's compatibility with XML 1.1, a format that allows you to import and export data from your project and its clips to and from other programs. This means it's now finally possible to bring your projects from FCP7 into Apple's new flagship editing application - although this can only be done via a third-party program called 7toX. It's not all good news though. For instance, it's still impossible to create sequences of any size - you're limited to a select few standard options. And if you work in green screen a lot, you'll puzzle at the absence of garbage mattes. However, the list of missing features is dwindling and it may be time to explore FCPX more seriously, especially if you can migrate your projects. This is the first version that we feel may be worth considering from a professional perspective.